Is Miley Cyrus Wearing Her Old Engagement Ring from Liam Hemsworth? 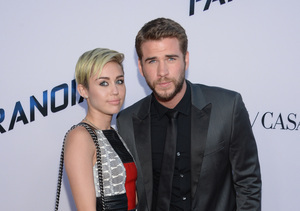 Headline maker Miley Cyrus is fueling more rumors that she’s back together with Liam Hemsworth. In a new pic on Instagram, she showed off a large sparkler, which looks similar to her old engagement ring that Liam gave to her when he popped the question in 2012. Is it it the same ring? You be the judge! TMZ also reports that the formerly engaged couple are moving in together. Cyrus was spotted unloading items from a U-Haul truck at Liam’s home in Malibu over the weekend.